Britain’s new polar research ship is ready to go in the water. The newly assembled hull of the RRS Sir David Attenborough is now standing on the slipway of the Cammell Laird yard in Birkenhead, awaiting launch day. Weather and tide permitting, she should slide into the River Mersey on Saturday. The £200m vessel will replace the James Clark Ross and the Endurance, which between them have almost 50 years’ service in support of UK polar science. The Attenborough is the ship the public had wanted to call “Boaty McBoatface” in an online poll, before ministers stepped in to choose a more appropriate name. 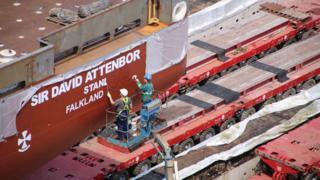 She represents the largest commercial ship built in Britain in three decades. 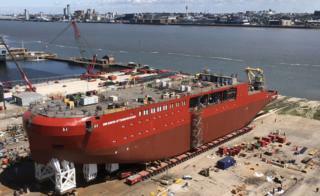 The hull should make for quite a sight as her steelwork floats out into Liverpool’s famous waters. The ‘monster’ berg: What happened next? “She’s not a huge supertanker but she is a large ship at 128.9m and around 10,000 tonnes on the day – so, there will be a bit of a splash, certainly off the stern,” said Cammell Laird’s David Williams. “She’s got quite a flat transom and as that makes the transition to the water, there will be some waves created,” the business development director told BBC News. The company will have an invited audience in the yard on Saturday of more than 2,000 people, made up of VIPs, staff and their families. But star of the day will, of course, be Sir David himself. The BBC naturalist will be asked to press the button that unleashes his namesake on its grand slide into the water. 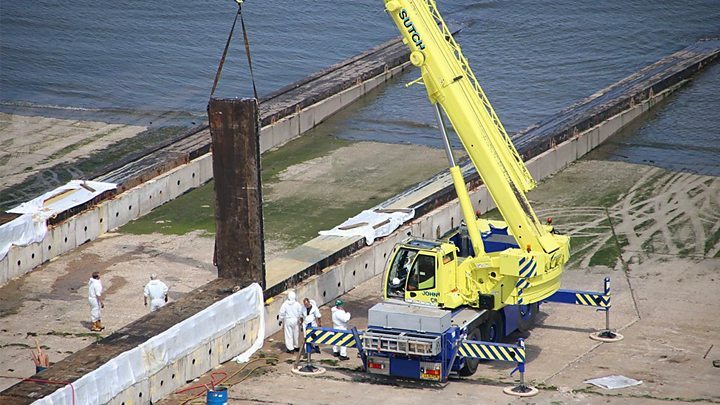 Recent days have seen the hull lifted out of Cammell Laird’s giant construction hall by a fleet of remote controlled, multi-wheeled trolleys. These vehicles have placed the ship atop a set of rails, or “standing ways”, covered in grease. Temporary fixtures on the underside of the hull have been attached to shoes, or “moving ways”, and at the appointed time these should glide the Attenborough effortlessly down the gentle slope to the river. It will be an important moment for Cammell Laird which has fought hard to position itself in the competitive international shipbuilding market. Not since 1993 has a vessel built at the yard been launched into the water in this dynamic fashion. Once in the water, the hull will be caught by tugs, which will manoeuvre it into the company’s harbour. The harbour is where the top decks – built as a large, separate structure – will be put in place. Detailed outfitting then follows before the ship is complete and ready for its official naming ceremony at the end of the year. 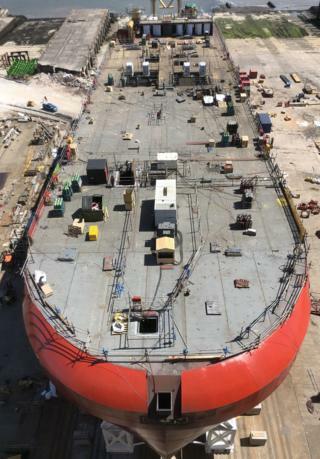 “We’ve definitely risen to the challenge, as many people will realise, especially when they see how advanced she is right now, given the timeframe since we first started building her,” said Claire Biggar, assistant ship manager at Cammell Laird. 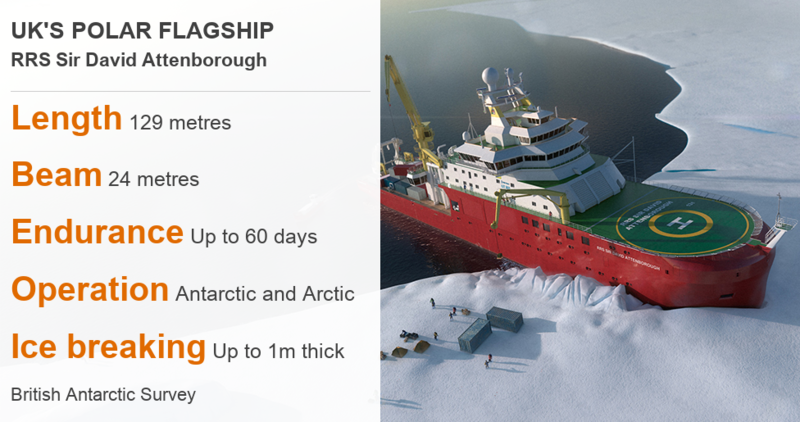 The BBC will have coverage of the launch on the day, and the British Antarctic Survey will also stream the event.